The Super Bowl, Valentine’s Day, Presidents’ Day, Mardi Gras, Ash Wednesday, the Chinese New Year, and Flag Day compete for attention. I can’t celebrate them all, so there are a few holidays I plan to just skip. Although February is national “Adopt a Rabbit” month, I already have a surplus of plant-munching bunnies, thank you very much, so I won’t be participating. It’s the Cricket World Cup, and although I’m a diehard sports fan, I won’t be watching. I observed “National Library Lovers” and “National Bird Feeders” month. I selected my CD’s for “National Opera Day” on February 8th and counted the days until “National Drink Wine Day” on February 18th. For foodies, it’s national “Barley,” “Grapefruit,” and “Cherry” month. There are also “National Jell-O” and “National Pancake” weeks. I squeezed in “National Crepe Day” and “National Ice Cream for Breakfast Day” on the 2nd. National Bagel Day and Pizza Day were both on the 9th, and “Gum Drop Day” on the 15th. “National Almond Day” arrived on the 16th, and “National Chocolate Mint Day” on the 19th. “National Chili Day” ends the busy month of February on the 28th. As winter continues to fill our view, spirits can begin to tumble. 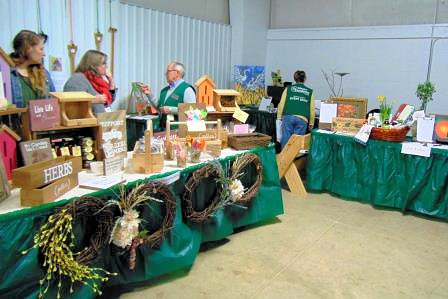 Fortunately, the dedicated group of Master Gardens in Elkhart County, IN and the surrounding area known as the Michiana Master Gardeners came to the rescue with "Think Spring!" 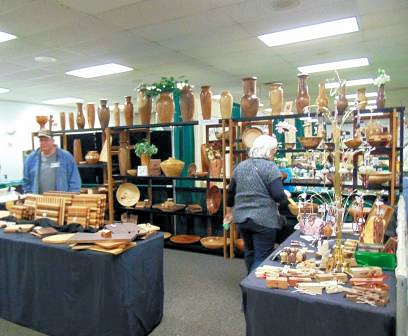 This was the group’s first ever Garden Expo, and having been to hundreds of similar events in the past, this reporter feels they did a great job! 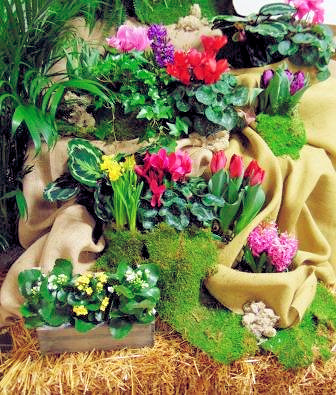 Overcast and dreary outdoors, inside the fragrance of flowers and bright blooms brought smiles to every face. I don't think I've ever seen a group of gardeners work so hard at making sure everyone felt welcomed. Cheerful volunteers were posted here and there and definitely at all the critical spots to answer questions and give directions. There was ample time to enjoy coffee and a delicious "French Toast"muffin and still visit nearly fifty garden-related vendors. Of course, my first stop had to be the used gardening book stall. Despite my resolve and bursting book shelves at home, a copy of Rosalind Creacy's "The Edible French Garden" for only $2.00 was irresistible. There was a delightful variety of booths including the host group's offerings of plants, seeds, bags of canna bulbs and more. This creative woodworker had items I’d never seen anywhere before, even in Germany and the fabric items in this booth were lovely. Of course there were plants, succulents, and a honey booth. There were bird houses and bird feeders galore, pottery, knitting and felting, big bags of worm casings, garden art, fragrant soaps, and much, much more. Groups like the Indiana Native Plant Society, the Audubon Society, Indiana Master Naturalists, and WELLFIELD Botanic Gardens were there. Tables of tempting silent auction items that were drawing the attention of the early crowd filled one corner. And dozens of door prizes were awarded throughout the day to happy winners. The highlight for me, and the main reason I drove over two hours was to hear Barbara Pleasant, long-time contributor to "Mother Earth News," "Organic Gardener," "Grow Veg," and "American Gardener" magazines, as well as the author of several books.Her morning presentation was "Spring into the Season: Better Gardens, Less Work!" Filled with pictures of her bursting Virginia gardens and years of experience, this talk alone was worth the trip. I especially appreciated the way she tied bits of Indiana into her talk, and various garden quotes like "The foolish man seeks happiness in the distance; the wise man grows it under his feet." James Oppenheim. I'm pretty sure everyone in the audience learned something, no matter how experienced they were. 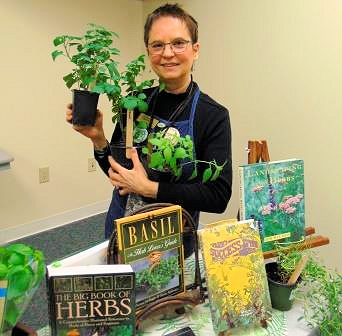 I also attended an excellent talk given by a former herb farm customer, Marcy Dailey entitled "Take Time to Smell the Herbs." Anytime I can sit with a group of herb lovers, I'm happy. Marcy has a lovely colonial herb garden, and operates Fawn Run Farm Mercantile in Rolling Prairie, Indiana. After a quick lunch, Ms. Pleasant's second presentation, "Plant to Preserve" was given to an enthusiastic audience. 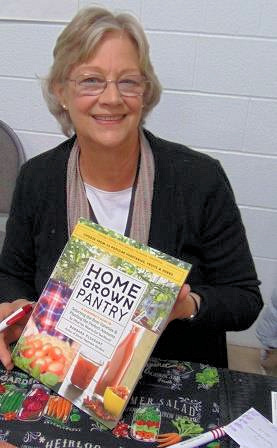 Based on her newest book, "The Homegrown Pantry" her talk was filled with pictures of mouth-watering veggies, shelves of preserved jars and crates of squashes and pumpkins. Lots of ideas on preserving the bounty beyond just winter storage, canning, and freezing were offered, including some of the best varieties to grow for long term use. The information on commercial produce ala whatsonmyfood.org convinced many attendees to begin to grow their own. I'm definitely going to make her "Onion Jam" and beet raisins. There were other speakers doing concurrent talks. Author Mike McGroarty gave two presentations on shrubs and pruning, and Michigan’s 2018 Beekeeper of the Year, Charlotte Hubbard spoke on “Beyond the Bees Knees!” later in the afternoon, but with a two-hour drive back home I elected to select my free seeds and depart. 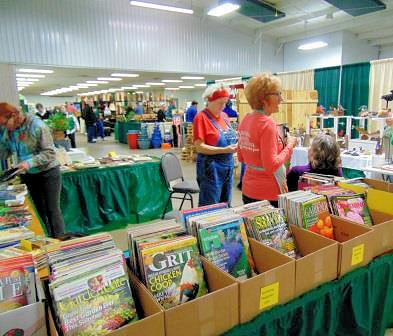 Hats off to the Michiana Master Gardeners! All in all, it was a very Barbara Pleasant Day! *The Vincennes, named for the fort that became an Indiana town, was the first U.S. naval ship to circumnavigate the globe, in 1830! *The Carolee’s Herb Farm website had over 26,000 hits in January! 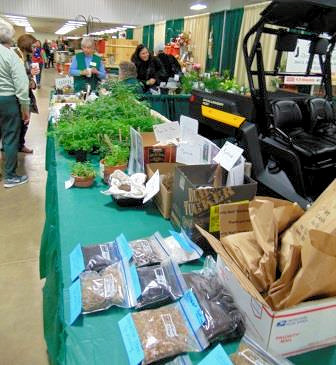 The interest in herbs and gardening still grows! *Indiana has a state soil, “MIAMI” designated in 1986! There are several varieties of red clover, including “Mammoth Red Clover” and “Medium Red Clover.” Both are quick-growing and cold tolerant upright-growing crops. “Mammoth” can fix over 110 lbs. of nitrogen per acre while “Medium” can fix up to 150 lbs. per acre! Both also grow extremely long tap roots that grow deeply into hard soils in effect “mining” other valuable nutrients and making them available to other crops if the clover is used as a cover crop. Clover is an excellent crop for preventing erosion. Growing up on a Hoosier farm, I often picked the rosy ball-shaped clover heads and popped them into my mouth for a sweet snack. Bees & butterflies love them, too, although most honeybees prefer the smaller, sweeter white clover. I never thought of them as a medicinal herb, but clover has a long history of use. There are records showing that Shakers of Hancock Co. Mass. sold dried whole red clover heads in 1828. In 1830 the Shakers at Watervliet, N.Y. offered red clover dried and as an extract, as well as 129 other herbs and 6 other extracts. By 1860, an extract of red clover, along with the extracts of 25 other herbs were added to the catalog, which also contained 292 herbs and 73 varieties of garden seeds. 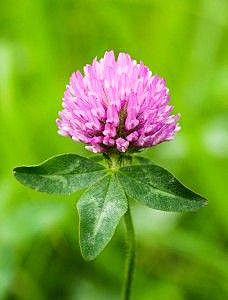 Noted author and researcher, James Duke reported in his book “Green Pharmacy” that red clover has a long folklore tradition as a remedy for cancer. More recent studies have revealed that indeed, red clover contains giogenic, an anti-angiogenic that starves tumors of their blood supply. Additionally, red clover contains isoflavones, which aid in reducing menopausal symptoms. It also contains phytoestrogens which can help minimize menstrual cramping. The usual method of use is an herbal tea made with the fresh or dried flower heads. Red clover tea is also known as a relaxant and expectorant, so it is useful in treating coughs and bronchitis, and as a blood tonic. It has also been used as an external wash for psoriasis and eczema. So, the next time you pass a field of hay with pretty rosy bloom balls, think of all the benefits that clover provides for enriching the soil, feeding livestock, preventing erosion, and supporting bees and butterflies. And you might think of adding a patch of clover for beneficial herbal teas. I canned way too many green beans last summer, so in looking for new ways to use them, this recipe was created. 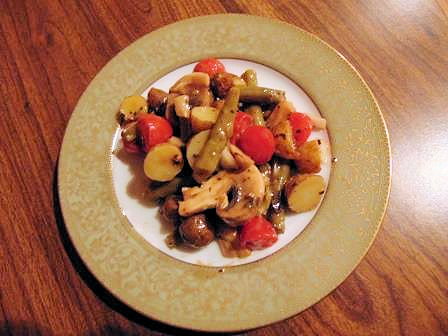 Combine in large bowl: 2 c. cooked green beans in bite-sized pieces; 1 ½ c. cooked potatoes cut in bite-sized pieces; 1 c. halved cherry tomatoes; 1 c. sliced mushrooms (fresh or canned) ¼ c. diced green onions, salt and pepper to taste. For dressing combine in jar and shake well: ½ c. oil; 3 T. lemon juice; 2 T. honey; 1 T. Dijon mustard; 2 tsp. dried savory (or 1 tsp. each dried basil and oregano) Serves 4.